Doopsgezinde Kerk, Den Helder, 1968. Photo by Gerard Dukker, Rijksdienst voor het Cultureel Erfgoed. 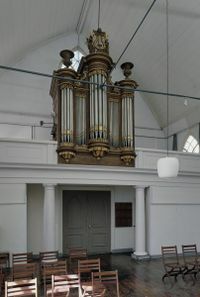 Interior of the Doopsgezinde Kerk, Den Helder. Helder (or Den Helder), a town (1954 population 41,199 with 337 Mennonites; 2007 population 58,000) in the Dutch province of North Holland, now the most important base of the Royal Netherlands Navy, consists of three parts — the old town of Huisduinen, Den Helder, and Nieuwediep. In Huisduinen there has been a Mennonite congregation from very early times, at first called Flemish, later also called Frisian. It had apparently come into being by the merging of the Flemish and a Frisian congregation. Of this Frisian congregation nothing is known. Of the Flemish church there is only scarce information: it was a small congregation, whose members were mostly poor fishermen. The congregation was represented at the Flemish conference at Haarlem in 1649 and Leiden in 1660. The Flemish-Frisian congregation was merged in 1731 with a Waterlander congregation at Den Helder; at the time of this union the membership of the Huisduinen congregation was 60 baptized members, that of Den Helder only 25. The united congregation was rather poor in the 18th century; it was regularly subsidized both by the Amsterdam Lamist congregation and the Frisian Conference (Vriesche Sociëteit) of North Holland. The Huisduinen congregation had a brick meetinghouse, that of Den Helder a frame one erected in 1702. After the union of 1731 both meetinghouses remained in use until 1788, when the Huisduinen church was torn down and that of Den Helder replaced by a new brick church. 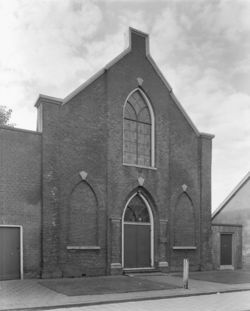 This church was sold in 1853 after a new church had been built at Nieuwediep which is still in use. In the 18th century this congregation is usually called Huisduinen and Helder, in the 19th century Helder and Huisduinen, and now only Den Helder. In 1811-1813 the meetinghouse was occupied by French soldiers until 30 June 1814. The membership, numbering 85 in 1731, increased to 132 in 1847, 179 in 1861, 227 in 1954. In 1922-1941 the church of Den Hoorn on the island of Texel merged their preaching services with Helder. Pastors who served here from 1844 until the 1950s were P. Douwes Dekker 1844-1861, J. Dyserinck 1861-1879, J. P. van der Vegte 1880-1888, D. Kossen 1891-1895, C. B. Hylkema 1896-1899, J. Keulen 1900-1909, J. Koster 1909-1926, P. J. Smidts 1927-1941, Miss T. Rothfusz 1946-1948, J. J. J. van Sluys 1949-1954. Church activities in the 1950s included a Sunday school for children (since 1896), ladies' circle, men's circle, church choir, and Bible group. Hege, Christian and Christian Neff. Mennonitisches Lexikon, 4 vols. Frankfurt & Weierhof: Hege; Karlsruhe: Schneider, 1913-1967: v. II, 279. Hoop Scheffer, Jacob Gijsbert de. Inventaris der Archiefstukken berustende bij de Vereenigde Doopsgezinde Gemeente to Amsterdam, 2 vols. Amsterdam: Uitgegeven en ten geschenke aangeboden door den Kerkeraad dier Gemeente, 1883-1884: II, Nos. 1906-1923; II: 2, No. 98. Naamlijst der tegenwoordig in dienst zijnde predikanten der Mennoniten in de vereenigde Nederlanden (1815): 89 f.
van Sluys, J. J. J. "Den Helder (Noord-Holland, Netherlands)." Global Anabaptist Mennonite Encyclopedia Online. 1956. Web. 22 Apr 2019. http://gameo.org/index.php?title=Den_Helder_(Noord-Holland,_Netherlands)&oldid=145171. van Sluys, J. J. J. (1956). Den Helder (Noord-Holland, Netherlands). Global Anabaptist Mennonite Encyclopedia Online. Retrieved 22 April 2019, from http://gameo.org/index.php?title=Den_Helder_(Noord-Holland,_Netherlands)&oldid=145171. Adapted by permission of Herald Press, Harrisonburg, Virginia, from Mennonite Encyclopedia, Vol. 2, p. 694. All rights reserved.